With fronds that produce bulbils, Asplenium bulbiferum or ‘Hen and Chicken Fern’ is a wonderful hardy fern native to both Australia and New Zealand. In the USA it is called the ‘Mother Fern’ and sometimes the Mother spleenwort. An erect fern reaching 1m + depending on conditions this is a rainforest fern, wide ranging from QLD to Tasmania and across to South Australia as well as New Guinea and New Zealand. So why Hen and Chicken or Mother Fern ? The plant produces little ‘plantlets’ on the tip of the fronds, these can pull the fronds down and the plantlets take root. With typical ferny foliage Asplenium bulbiferum will produce a nice rounded plant in good conditions in an open situation. An attractive weeping habit with fronds reaching nearly 1m in length this is also a fern that can be grown in a container. Although classed as an epiphytic fern as it grows on rocks and tree fern trunks it also grows well as a terrestrial plant. The new foliage is a bright green turning darker with age. 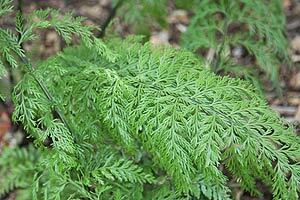 The fern has a crown and foliage unfurls from it. 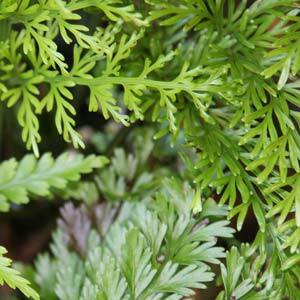 Well suited to a area of dappled shade and with a requirement of moist soil Asplenium bulbiferum requires little extra care. Old fronds can be removed to improve appearance. The bulbils produced will turn into new plants, in nature they will touch the ground and send down roots, this can be encouraged in the garden as well. Plants can also be divided in spring. For the bulbils to take root they will need good moist conditions. Origins – Australia and New Zealand. Soil – A well moist drained humus rich.